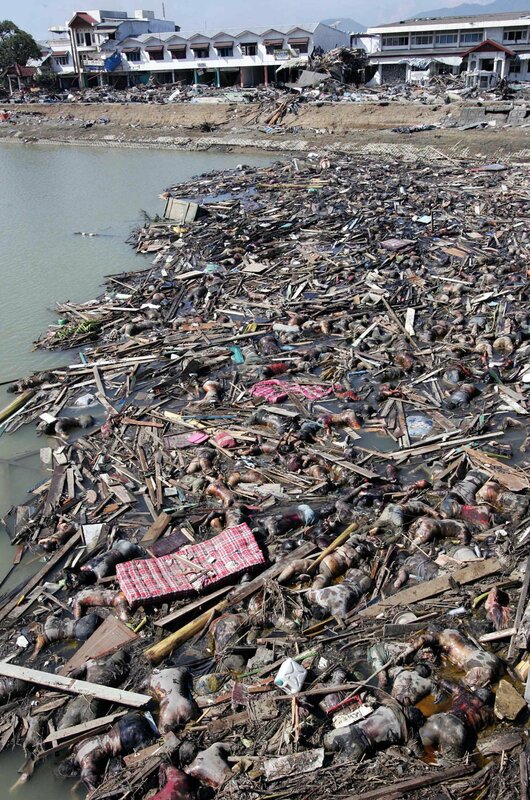 It’s time for the obligatory post about the Asian Tsunami. The devastation shown on television is extraordinary – so extraordinary, in fact, that my mother spent most of last night describing it as “biblical”. Certainly, as Boris Johnson says this morning, there’s no one to blame, nothing we can do to prevent it, so we may as well watch, wonder and help in any way we can. And there I was last night, watching, thinking how good it was that so many people were donating, never once thinking that I should be donating myself. I’ve got debts, I argued internally, and they’re far more important. Except, of course, they’re not. It took my mother’s suggestion last night to spur me on, and this morning I donated ?50 to the Salvation Army. So, lots of questions come out of this “biblical” event. And here are a few of the answers, in true internet-linky style. – What is a Tsunami? Come now. Don’t you remember those geography lessons at school? If you were too busy flicking rubber bands at friends and enemies, here’s a good explanation from the BBC of the phenomenon. – So what happened this time? Well, the BBC again comes up with the goods, with this description of how events unfolded. – Where can I see video footage of the devastation? If anything will spur you on to donate hard-earned cash, the videos will do it. Waxy.org has all the videos and links he can muster – and he’s always adding more. Watch and wonder. – Blimey. Where can I donate? I thought you’d never ask. Here’s a list of websites currently accepting donations. Easy, tiger. Try these links: Lost Remote, 2Bangkok, and BoingBoing. UPDATE: For further incentive to donate, this may help. Warning: graphic and gory, but a scene that will be repeated many, many times over – and also one which may never be shown by the media.